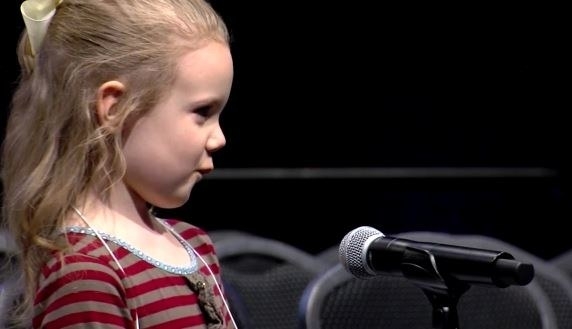 This May, the 90th annual National Spelling Bee will feature its youngest contestant in history: 5-year-old Edith Fuller of Oklahoma. Edith qualified for the national competition when she won her regional competition on Saturday, beating more than 50 other elementary and middle school students. After that, Edith and her mom began practicing for the bee, looking up words she misspelled along the way to learn their spellings and meanings. “Learning the words was so educational. She was able to learn about different countries and cultures and different kinds of food,” Fuller said. Despite her daughter’s spelling genius, Fuller said she was simply impressed that Edith was able to stick out the 4 hour competition. “It’s fun to share her with everyone. I knew she’d be a novelty, so I’m proud she held her own,” Fuller said.